A neutered cat is less likely to be aggressive toward a newcomer. If one cat gives you joy, imagine the unlimited bliss two will bring. Adopting a second cat when you have an established king feline isn't as simple as it sounds. Cats are social creatures, but they're also territorial and can be aggressive. Having everyone neutered can ease tensions, though. In the before-time, when your tom cat was an only-kitty and king of his castle, the entire house was his territory. But once you bring in a second cat, male or female, the newcomer will want to stake a claim for some personal space, shrinking the borders of your first cat's kingdom. Territorial aggression would be more of a problem if your cat weren't neutered; he would have hormones driving his desire to rule all that he surveys. That's not to say that aggression won't rear its ugly head, but if both cats are "fixed," they will be more likely to come to a compromise on who is the boss in which parts of the house. The key to giving your cats the best shot at living peacefully together is to introduce them properly, which means introducing them gradually. Start out with keeping the new cat in a room of his own with the door closed so that your first cat will have a chance to get used to the scent of the new kitty without being confronted by a strange cat in his home. Don't let your older cat camp out at the closed door growling and hissing, as it would stress the new cat. After a few days or maybe as long as a week, you can begin allowing the cats face-to-face contact in a supervised setting. You can even put the new cat in his traveling crate and bring him into the living room or kitchen. Feed both cats a tasty treat at the same time and in view of each other. This will encourage the association of a pleasant experience in each other's company. 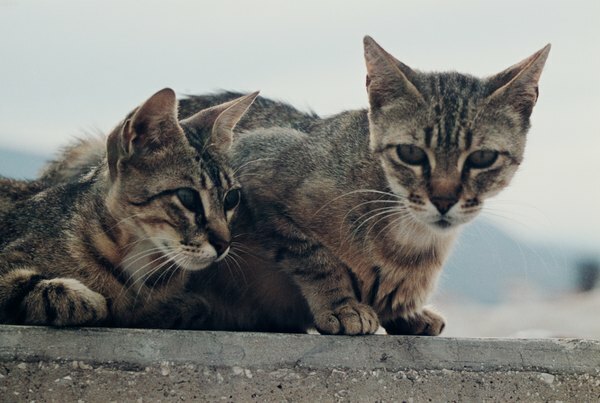 There is always the chance that your cats will get along famously from the start, but keep in mind that you may have a long road ahead as you gradually increase the amount of time, supervised and unsupervised, that they spend together. Providing adequate accommodations will go a long way in reassuring your established cat and your new cat and encouraging peaceful coexistence. Provide individual food and water bowls for each cat as well as a litter box for each. Both cats should have their own bed or basket, and if you have the room, an additional scratching post for the new kitty will give him a place to mark up and call his own. The two cats may eventually end up sharing some or all of it, but at least it will be their decision born out of camaraderie rather than having it forced upon them. Before adding a second cat to your family, it's a good idea to take stock of your situation and make sure that it is a good time to adopt. Consider whether you have enough space for a second cat, his food dishes and extra litter box. Also determine if you have enough time to devote to properly introducing your new cat to your established kitty. If your first cat is having health or behavioral issues, it might not be the best time to bring in a newcomer, as it will add to his stress. Waiting to adopt until you've dealt with existing issues will ensure that there are fewer problems with your new arrival. Why Use a Cat Playpen? What Makes a Male Cat Spray? What Changes Occur After a Male Cat Is Neutered? What Qualifies You as a Cat Lady?